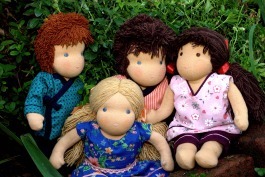 These exquisitely made dolls are based on the educational philosophy of Rudolf Steiner, which acknowledges the various unique children’s needs and aims to respond to them holistically through activity, imagination and creativity. A doll for a child is either a reflection of him or herself or of another person and thus can become a trustworthy companion and confidante. Therefore, the facial expressions and appearance of our Friendship Dolls are kept intentionally simple, allowing the doll to resemble the full range of human emotions and giving the child the freedom to imitate, imagine and play out whatever is important in his or her own life. As young children develop their feelings and knowledge about themselves and their surroundings – largely through touch and bodily sensations – it is vital that we use soft, warm, natural materials in making our dolls. Thus we fill them tightly with pure sheep wool, giving them weight and firmness just like a real child and making their limbs flexible, which allows for natural postures and easy handling. The ‘skin’ of our Friendship Dolls is made of pure cotton knit and we dress them in simple, attractive cotton garments. Maybe the doll is hungry! Also, each doll is made caringly by only one Doll Maker in a stimulating and congenial environment: this we believe will add to the ‘spirit’ of the doll, enhancing its overall attraction for its young owner and encouraging strong emotional bonds. Our dolls are designed and crafted for children to enjoy and treasure for years to come: simple, individual, beautiful and well-made with a built-in legacy of the maker’s loving touch.